A masterpiece film has masterpiece music. Sometimes the masterpiece music exists as an ensemble that highlights the masterpiece film more than simple background music. For Kim Tae-seong, there is one masterpiece composition that stood out like a landmark in his life as a music director for films: Ennio Morricone’s score for Cinema Paradiso, a film that touchingly portrays the friendship across generations between characters Alfredo and Toto. How many times did Kim listen to this score? He reached a point where he could write down the music by himself, humming the melody without even looking at the notes. Ennio Morricone became the name he wanted to be and resemble the most. Now Kim Tae-seong is a music director renowned and trusted by the film industry in Korea, but as a child, he was a “cinema kid” who would secretly borrow movies without his parents’ permission and stay in his room all day. In particular, the music composed by Morricone, the maestro of film music, always inspired him to dream of becoming a composer just like him. As a child, Kim learned many musical instruments, since he had various tastes and opinions on things, and he ended up sticking with the piano. He entered university to study classical music composition, but he decided to take some time off after his freshman year in 1999. It was because of his enormous desire to experience the reality of movie music, the field he’d wanted to work in since his childhood. At the time, the Korean film industry had just opened a new chapter with the movie Shiri and offered infinite opportunities and possibilities for growth. He started to make demo tapes of his music and sent them to all the famous movie directors and film companies. He didn’t expect to hear from any, but at least he was happy doing that. One day, he received a call saying they wanted his music for a movie trailer. He was so thrilled. Luckily, Kim was able to make music for the Champion trailer, followed by Once Upon a Time in a Battlefield and Lover’s Concerto, and he officially debuted as a film music director with the movie Au Revoir, UFO in 2004. Most actively working music directors in Korea are from an older generation than him, which make Kim a young music director. Even though he started early, he has made so many mistakes and failures. Music directors read the scripts or scenario and discuss with producers, directors, and sound editors about the characteristics of the movie and how it flows, which leads to decisions on music selection for each scene or situation. When the soundtrack album is made and selected songs are arranged or new songs are written, they choose singers or session members together. Film music, usually considered to be a realm of personal work, becomes a realm of common work. For the first time, Kim realized how much the tuning and communications between people working together can influence the result through his work on Crossing. The film Crossing far more awards than he had expected. Kim was even asked to work in Europe after this film. He realized that the things he had insisted on were not always right. The wide range of music in films from such different genres and scales as Twenty, Office, and The Sound of a Flower was all created by the hands of Kim Tae-seong. His music, which adds more vividness to the story, was also used in the movie titled The Priests. As the film was about the stories of priests, Kim used medieval religious music as a motif and the starting point for an original score. After many mistakes, he began to focus on what he learned from those mistakes, which was to create film music that captivates the audience. In the process, he was able to help the movies such as War of the Arrows and The Admiral to become box office hits. Now Kim is a music director that make music for movies that attract more than 10 million viewers to the screen, but he cautions against blindly focusing on films. Kim says a good music director knows how to maintain his or her originality as a musician as well as to ensure the commerciality of the work. Just like the name of his studio, Monopole, which means to find the root of this world, he says he’s still studying all the time as he attempts to make new efforts. For the first time in Korean film history, Kim worked on his music in Warner Bros. Studio in Hollywood, and he’s the only one from Korea who still continues his work there. With the movie The King’s Case Note released last year, 1987, and Golden Slumber this year, all the music for these films was produced in the Hollywood studio. In the background music for The King’s Case Note, which captivates the ears of the audience with its majestic sound and maximizes the adventurous elements of the movie, no Korean music scales or instruments were used, unlike traditional Korean historical dramas, but instead melodies with Hollywood’s adventure movie style were incorporated. The splendid, majestic music of grand scale created by a large-scale orchestra with 100 players doubled the excitement and thrill of the spectacular adventure and offered something different to listen to. There are reasons for recording in Hollywood studios, which cost more and pose more difficulties. Kim reflects on his issues of expanding the spectrum of his music and how to study and improve it along with endless issues of the Korean film industry, such as the position of film music in the Korean movie market, ways of working on film music, and its limitations. 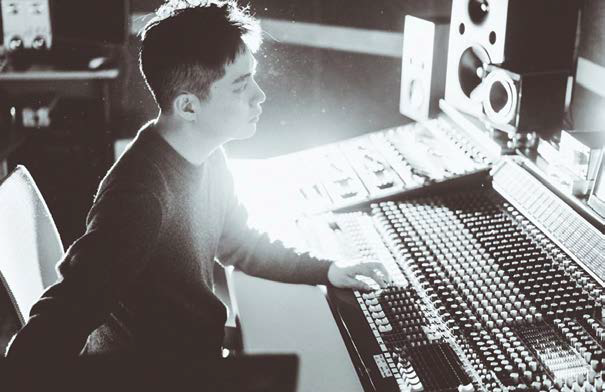 Kim has become the music director who gets the most calls from the Korean film industry, a music director who doesn’t have to worry about his name making the film credits, but what he wants the most is more work. It’s because he is expected to work on more music with his abilities. He says the better you know, the more you see, and he tries to make some time in his busy schedule to read books and watch films to meet and experience all kinds of humans and things that exist in this world. With his work for 1987, which came out last year, and Golden Slumber this year, he’s made another turning point for his life as music director. The music for Golden Slumber was acclaimed for following the changes in emotions well-expressed by excellent acting and is known to have been paid the highest royalties for film music in Korean movie history. The amount was comparable to a guarantee paid to a top movie star. Kim is always willing to make new attempts and challenges and has a great list upcoming projects. Idol starring Sol Kyung-gu and Han Suk-kyu, Sabaha with Lee Jung-jae, Default with Kim Hye-soo and Yoo Ah-in, and Extreme Job starring Ryu Seung-ryong will all be completed with his music. Kim Tae-seong says he wants to make film music that hums around the viewers’ ears after watching a movie, as if the impressive scenes of the movie linger on. His greatest motivation and inspiration is his hope for a day when Korean film music will be recognized by the world just as other Korean actors and film directors get nominated or awarded in prestigious film festivals around the world.